Throat, also termed in science as the pharynx, is on a tube like structure that carries food to esophagus and air to the larynx. Due to its direct contact and exposure to the outer environment, the infective agents enter into the system through the nose and the mouth. These infections may be viral or bacterial in nature. So basically, that conditions like body aches, headaches, etc. Also, there might be several serious symptoms like choking, problems in breathing, pale or blue lips, increase in heart rate, anxiety, high temperatures, sudden swelling in the throat structures and further conditions like passing out, change in mental state or sudden change in behavior like hallucinating, delusions, delirium, lethargy, etc. There are several throat infection conditions that can be cured using antibiotics if the infection is due to bacteria, whereas the infection due to viruses clears up on their own. One of the effective measures to cure throat infection is acupressure. The points those are effective in treating the throat infection problem are given in the image. Details how to apply pressure on the point is given at “How to apply pressure on acu-points?”. 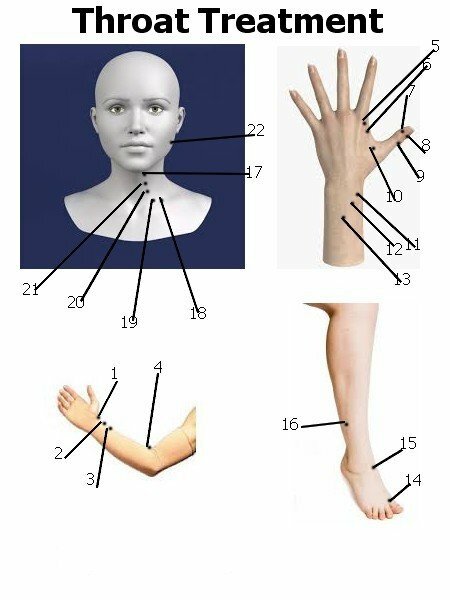 The points which are present on either side of the body should be massaged the same manner. Along with the acupressure techniques, one should drink warm water with one quarter of chopped ginger and tea with ginger in it.